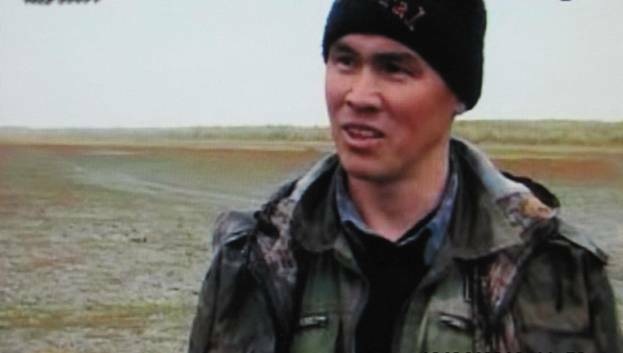 At the beginning of April, 2012 I casually saw at YOUTUBE a video named "Tracks of the yeti on Yamal". It was known already for me that there were encounterings and observations of hairy hominoids in Taiga and along the lower northern part of Ob river. Such data were published in N.L.Gondatti's book "Traces of paganism among locals of the North-West Siberia", 1888. The Mansy people named them as Menkv, the locals worshiped such creatures, as well as they felt to bears. In the 1970-th Vladimir Pushkarev and Valeria Pupko carried out some ethnographic expeditions which have been specially focused on information search about hairy wood giants. V. Pushkarev had education as geologist, but he started to attend a new course in biology at Kalinin (now Tver) university, and the materials of his expeditions were used as reports and papers with information about such creatures there. V. Pushkarev was lost in Taiga in 1978 during his last expedition to upper Synia and Hulga rivers valleys. These places are somewhat close to the banks mentioned in the video. After Pushkarev's tragedy no wide researches of hominoids there were carried out. 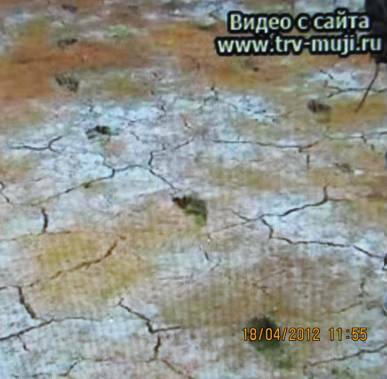 Therefore I with great interest have got acquainted with new facts in the video provided by local TV company TRV-MUJI, located in Muji (Muzhi) settlement on the west bank of Ob river. Here we can see some still shots from this film. 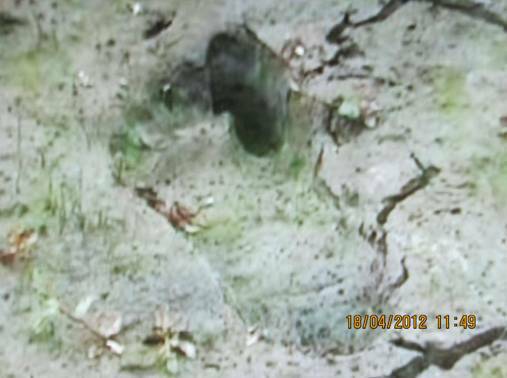 The title of the video shows that the finding had place in September of 2011. 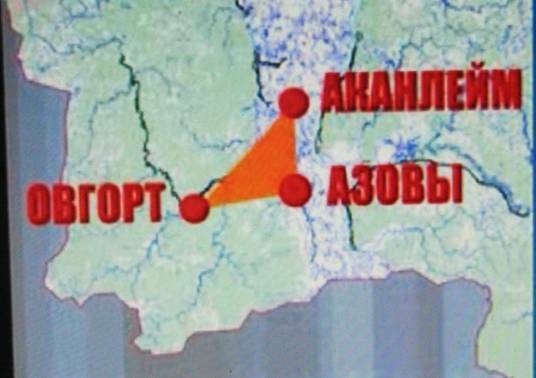 This occurred near small settlement named Akanleim in valley of Ob river. The local dweller Pavel Sandrin narrates about the tracks here and elsewhere. 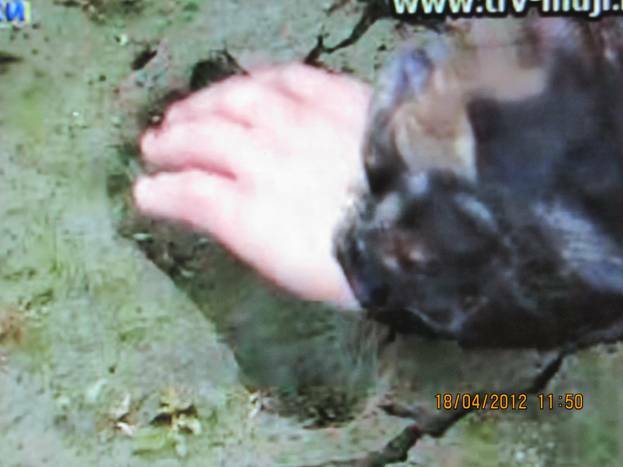 Behind his a wet flat bank where the tracks were found is seen. One of the clearly seen tracks. One more of deep tracks, there were a lot of them on the bank. There were tracks made by different creatures, small and big (children and adults?). After I became acquainted with this video and examining some stills I was convinced that the tracks are original. Yet no metric measurements were provided. In short, the big toes on creature 's feet can bend independently from other four toes and drop deep into wet ground to keep steady movement. Feet of human are not capable to bent in such a way. So, I hastened to contact the producer and editor of this video. My first letter to Edward Sekretov remained without any answer. Then I addressed with letter to the heads of the TV company. This was also disregarded. Considering that the findings have significant scientific value, I have no doubts that it is necessary to renew researches in this area. Below I convey my somewhat cut letters to producers of the movie. It was became known in September, 2011, about findings of bare feet similar to human's, and they are the most new observations known to us now. 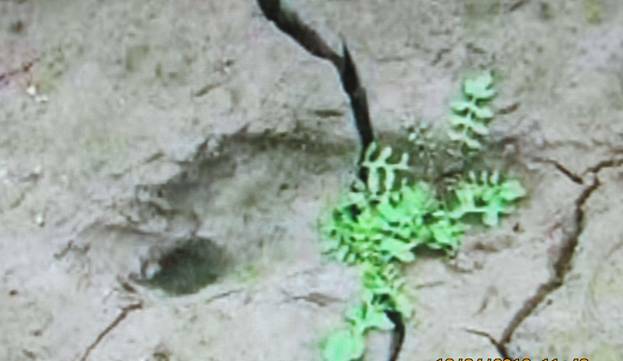 Subject: About traces of "yeti"
some time ago I saw a video film that was made by your TV company about finding of many barefoot tracks on bank of Ob river. I sent the letter provided below on significant scientific value of this findings to producer Edward Sekretov. No answer followed. So I send you a copy of that letters in hope to receive your response because this subject which was raised into view by your movie seems to be very important for science. my name is Michael Trachtengerts, I live in Moscow. For a long time the problem of the “snow man” is in my attention. 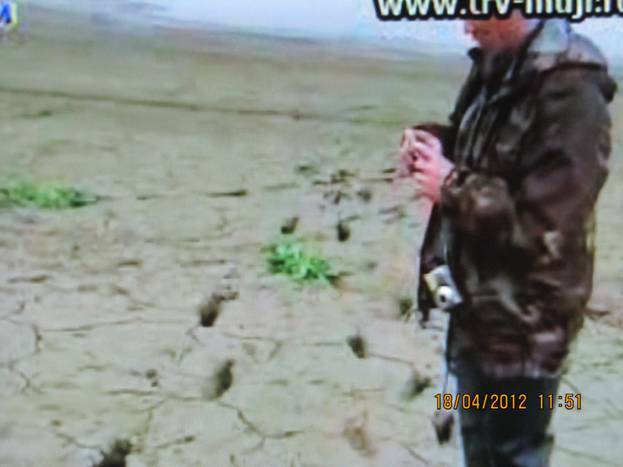 Just now I saw your video footage on human-like tracks on bank of Ob River. I consider it as an extremely important authentic finding. As a matter of fact, until this event there were no finding of so many tracks of hominoids in one place in our country before. operating seminar on this problem.. Probably, you saw sometime activists of the seminar on TV shows or elsewhere. Pushkarev with Victoria Pupko, Mark Gass, etc, carried out some expeditions there. It would be desirable to know your view on this problem. I can explain such neglecting pose of journalists mainly by modes in modern mass media. Usually they are interested only with sensations of the moment. In this case ― the sensation was shot, the subject passed away, forgotten and should not be remembered any more. It is good in any case, that the video remained available till now.